Why is it that pecan pie is almost exclusively reserved for the days that fall between Thanksgiving and Christmas? It’s not like pecans are seasonal. And it’s not like people don’t like pie year-round. So really — what’s up with that? Once you have this pie you’ll want to make it year-round — it’s that good. This recipe swaps out some of the corn syrup and pecans used in a traditional pecan pie with real maple syrup and oatmeal for a result that can only be described as ooey gooey oatmealy goodness. Throw in a shot of bourbon for good measure and you’ve got a pie with 365 potential. In a food processor, blend the flour, flax seeds and salt. Add the butter and pulse multiple times to combine. Add ice water, 1/2 tablespoon at a time, and continue pulsing until the dough comes together into a ball. Remove the dough from the food processor and form it into a flat disk. Wrap in plastic and refrigerate for at least 30 minutes. When ready to use, roll the dough into a 10-inch circle on a lightly floured surface. Transfer the dough to a 9-inch pie plate by gently folding it into quarters. Place dough in pie plate and carefully unfold, fitting loosely and then pressing it into place. Trim the excess dough. Do do decorative edges like I did, reroll the extra dough and cut it into eight circles using a shot glass. Cut each circle in half, then press into the side of the prepared pie crust. Chill prepared crust in the freezer for 15 minutes before filling and baking. In a large bowl, whisk all ingredients (excluding the pecan halves) together until well combined. Pour filling into chilled crust, decorate as desired with pecan halves (optional) and bake for 50 minutes or until the center is set. Allow to cool completely on a wire rack. Isn’t pecan pie also a traditional Kentucky Derby thing? I really like that flax is incorporated into the crust and oatmeal in the filling. No doubt it adds wonderful texture as well as taste to this pie. However, the maple, bourbon, pecan is a hard combo to resist. Your pie looks amazing-yum! I have crust envy. Your’s looks perfect! Girl, it’s really good and SO EASY! Going to try it again with 50/50 AP flour/whole wheat pastry. This looks great! 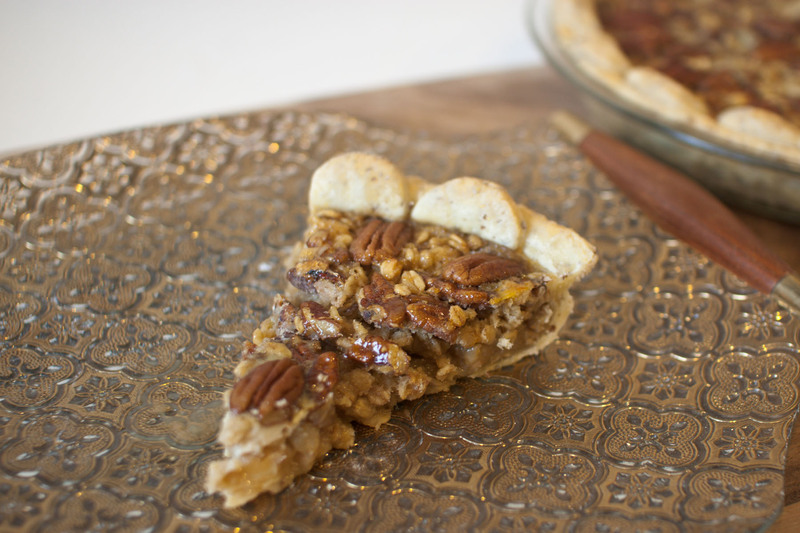 I just posted a traditional pecan pie, but will definitely have to try yours with oatmeal and maple. I also like that you used flax in the crust. I’m still working on making my own pie crusts — I struggle with it! This pie reminds me of one a local pub serves all year long that I can never resist (and I normally don’t make it to dessert). I love the flax seed crust changing it up a bit here. I’m totally on board with pecan pie not being confined to Thanksgiving. It’s too good! LOVE the flax crust idea…and the oatmeal too!